This album sent ripples of influence farther than almost any other in the folk idiom (okay, aside from Bob Dylan - but since maybe 1.3% of all the world's Bob Dylan fans are even aware of who Davy Graham is, the case is still valid). Incredibly pure and vibrant sound engineering captures Davy and his simple outfit of drums and bass perfectly (my original mono is one of the best-sounding records I own). As "tame" as it may sound to some - he was surely beyond any record-producing folk-artist of this time period. Though "Folk, Blues and Beyond" is rivaled in its progressive nature by a scant few other pre-1965 albums (namely "Tear Down The Walls" by Vince Martin & Fred Neil, "The New Folk Sound" by Terry Callier, and Sandy Bull's debut) I feel that this one still wins out for its overall creativity and execution... and since most of the songs aren't even his own compositions — we're really just talking about presence and delivery. Davy's inventiveness and ear for arranging all sorts of disparate musical styles is stunning on its own — but the collection of it all on this particular album comes out to something grander than the sum of its parts. An impeccable time-piece from one of the most criminally overlooked characters of the 20th century. 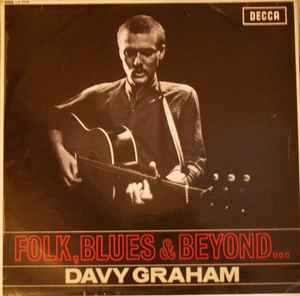 Released in December '64 this LP by Davy Graham was his second release and captures a far more adventurous side to his playing than the first record, "The Guitar Player", GGL 0224. However, compared to the music that was floating around at the time, it was nothing short of a revolution - perhaps 33 and a third more than other notables of the era such as The Beatles and Stones?! On these sixteen tracks of Blues led guitar, Graham makes it all sound so effortless and with a distinct English overtone, something not done at the time with British groups trying to ape the American sound. Here we have a leader and innovator. He has been cited by guitar greats as being a huge influence, however "tame" it may appear now. This is a great showcase for Graham's virtuosity and styles. The simple backing of Drums and Bass are almost incidental. The stand-out track has to be Maajun (A Taste Of Tangier). According to the sleeve notes, "In Tangier he worked for six months in a 'hole in the wall' eating-place whose speciality was a sweet, sticky cake flavoured with hashish." Here you can find licks that would later crop up in the darker Stones records, Psych' and Prog' and is ripe for a re-working. "Cocaine" and "Rock Me Baby" swings along with courteous charm and have their place on a Sunday morning listen. A great record that is thankfully several steps on from the finger-in-ear folk. A record to inspire and depress any budding guitarist.